It’s normal for supercars to birth special, upgraded versions. Think of them as the first real update; the version 2.0 of the road car, usually built more for track talent and collectability. Some will use them as they were made to be, while others will shut them into climate-controlled garages. Either way, cars like the Lamborghini Aventador SVJ always seem extra-special. Sometimes, the advent of a new flagship can ruin the appeal of the standard car. In the BMW M2’s case the Competition version actually killed its lesser sibling off altogether. Oops. But as far as Lamborghinis are concerned, they’ll always be special to me. A few years ago I was lucky enough to get caught up in a crazy game of chase between three factory-fresh raging bulls. As the sun rose over Lamborghini’s Sant’Agata Bolognese factory that morning there were five cars gathered outside the factory doors: two (then brand new) Huracans and three Aventadors. Our Mediterranean road trip was due to take us from the Sant’Agata factory in northern Italy to the increasingly popular elite motorsport circuit at Paul Ricard, in the south-east of France. After an initial schlep and a swift beach-and-coffee break I took the keys to a white Aventador with wonky tracking that I’d been warned about by the man who’d driven it before me. An American hack with plenty of supercar experience, he led the way in an orange Huracan, and he wasn’t hanging around. Sandwiched in third in the convoy, behind the American and a female Italian racing driver, I kept pace as we pulled up to the toll booth on the motorway entrance… and then a furious V10 suddenly drew every ear and eye with a full-bore launch. The final two cars weren’t playing along, and to this day I admire that level of restraint. They were quickly forgotten in the heat of the chase, though, because on the motorway between Italy and France you’re in tunnel country. Concrete tube after beautiful, sonorous concrete tube came to swallow three sharp streaks of light and noise, and with each one we’d each pull our left-hand paddles to release more revs; more noise, and then push our music pedals right into the carpet. People moved over, happily let us past, even rolled down windows to better hear this trio of local-born heroes reaching for 8000rpm. The moment went on for what seemed like hours like that, the cacophony of two Aventadors chasing a Huracan without a single care for fuel consumption or what anyone else might think. Each car’s feral noise fed the others’ unquenchable enthusiasm for the game we never planned, and when we finally reached Paul Ricard via tractor-slowed local roads I knew I’d never forget what I’d just done. Sure, on paper some Lamborghinis are more special than others. Some have more power, more exclusivity or less weight. 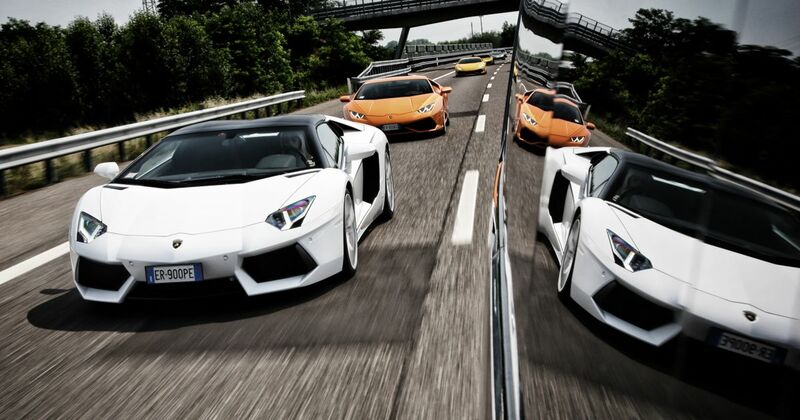 But on the road, all Lamborghinis are equal in the way they make you feel.